Bethesda, Maryland–(ENEWSPF)–February 21, 2017. The National Institute of Allergy and Infectious Diseases (NIAID), part of the National Institutes of Health, has launched a Phase 1 clinical trial to test an investigational vaccine intended to provide broad protection against a range of mosquito-transmitted diseases, such as Zika, malaria, West Nile fever and dengue fever, and to hinder the ability of mosquitoes to transmit such infections. 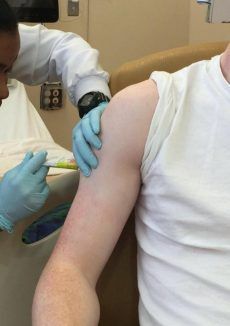 The study, which is being conducted at the NIH Clinical Center in Bethesda, Maryland, will examine the experimental vaccine’s safety and ability to generate an immune response.